The popularity of hawkers has soared in the recent years, quickly replacing the inclination to dine at overpriced cafes. Alongside the local classics of bak chor mee and cai fan (mixed rice stall), you can almost always find a western stall in most kopitiams. But how many of these stalls can say they have a restaurant (or one who used to be) chef in the kitchen? The Plug Food Co. sure can. For western food made by a restaurant-level chef at cut-rate prices, count me in! 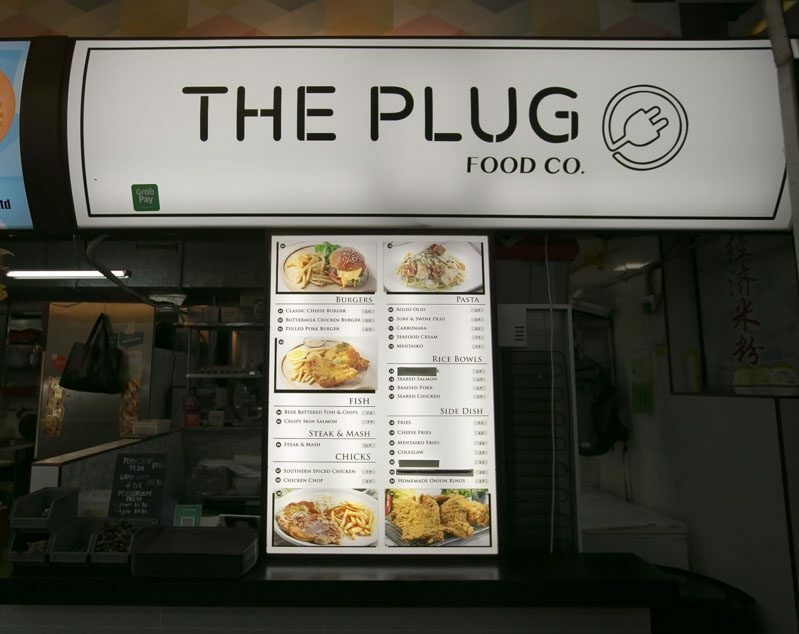 Situated at a hawker near Eunos MRT, ex Prive chef opens The Plug Food Co. trading in his chef whites for a more colloquial look of shorts and a t-shirt; yet his change in attire has not altered the standard of cooking he upholds. 25-year-old Donavan made the career jump to be his own boss, from the preparation that starts at 9am, he does the majority of the cooking until closing at 9pm. Despite the extended working hours and less-than-comfortable kitchen environment, he enjoys the liberty of creating new flavours, spurring him to continue his culinary journey. As he shared more about the individual dishes, our appetites grew. We ended up ordering a dish from every category on the menu — chicken, fish, burger and pasta. We made our way down after a long day at work and could not resist a taste of the Mentaiko Fries ($4.50) to curb our hunger. Greeted with a mountain of hot and crisp shoestring fries, topped with a generous serving of mentaiko sauce, no wonder it was a crowd favourite. Soft and potato-y on the inside with a crisp exterior, it was a side dish that definitely whetted my appetite. Albeit on the salty end of the spectrum, it came expected (so don’t get overly excited and attempt to slather on the mentaiko mayonnaise on a single fry). We devoured the mass of fries almost instantly, and started to doubt our decision to order two mentaiko dishes. But one taste of the Mentaiko Pasta ($7.90) soon abated any previous hesitation. The spaghetti was cooked al dente and coated with a creamy white sauce and topped with a spoonful of mentaiko, allowing us to mix it in according to our preference. Mentaiko-obsessed, we could not help mixing it all up. The cream base added a new depth of flavour that reminded me of classic carbonara (with mentaiko replacing the usual bacon’s saltiness), making it a quick favourite around the table. But the creaminess of the pasta following the mass of mentaiko fries made it rather jelak so we would recommend choosing only one of the two. As far as western food goes, chicken remains the “go-to” alternative when undecided on what to eat. So we gave the Southern Spiced Chicken ($7.90) a try. Drizzled with a lavish amount of Sriracha mayonnaise, it was undoubtedly different from any we’ve tried thus far. The tender-fleshed deep-fried chunk of chicken was overpowered, leaving only sour and spicy notes after every bite. Nevertheless, the chicken itself was good without the slather of sauce atop. For non-Sriracha lovers, perhaps try asking for the sauce on the side so you can adjust the amount of hot sauce to your preference. Prior to our visit, we’d heard raves over the Pulled Pork Burger ($6.90) and ordered one to try. Overflowing with a copious amount of shredded pork shoulder and purple cabbage slaw, it was a feat to get it all in one bite. Marinated overnight in barbecue sauce and other ingredients chef declined to share (because secret ingredients, so go try it for yourself or hazard a guess), before braising for a good eight hours, the pork was succulent and flavourful. I appreciate a good burger but this stood too far down on the salty end of the spectrum. The refreshing purple cabbage slaw did assuage some of the saltiness, but I found myself gulping down my drink after the second bite. What’s western cuisine without a classic plate of fish and chips? We could not leave without trying the Beer Battered Fish and Chips ($7.50). Here’s our take on this time-honoured classic. A thin slice of dory fish fillet was dunked into a beer-flavoured batter then deep-fried. The use of beer in the batter made it fluffier and retained the crustiness without being too floury. There was a lightness in the batter that made me rethink my prior aversion to fried fish and chips. The batter also helped retain the moisture in the fish through the deep-frying process and we were met with a soft and moist fillet that was flaky without being dry. A word of caution: eat this quick because the batter has a tendency to separate from the fillet as it cools down. In retrospect, The Plug Food Co can be said to be just another western stall in a hawker centre. But with dishes that push the boundaries of what most would call “classic western cuisine” at such affordable prices, it’s definitely worth a visit if you happen to be in the area.